The NICMs undeclared conflicts of interest! The response from a journal editor. “We understand conflict of interest concerns, but this is why we have strict guidelines and ethics committees …..” – Prof Alan Bensoussan, director of the National Institute of Complementary Medicine (NICM), Western Sydney University (WSU). All academics, including Alan, are fully aware of the importance of research integrity, in which, potential or perceived conflicts of interests play an integral part. As such, WSU does indeed have many rules and regulations to safeguard research integrity in order to ensure that one thing remains intact – summed up in one word: trust. These guidelines should ensure that the trust between taxpayer and scientist (or the scientific system) remains undamaged, because once it is broken or damaged it can have very serious consequences. We can notice all around us that the trust in the scientific system has been eroded over time. Just look at the number of people who do not ‘believe’ in vaccinations or climate change, then clearly, many people have grown a very healthy distrust in scientists and in the scientific system. It is therefore extremely important that universities act swiftly and decisively when a scientist endangers this trust, because the public does not necessarily look at the specific field of science where a transgression has occurred, they tend to distrust the whole academic system – and remember they keep the system afloat, financially. So, what is this all about? About a year ago I noticed that in a large number of published peer-reviewed acupuncture papers, authored by the NICM, they failed to declare a conflict of interest. This was quite interesting because they clearly had, and probably still have, a glaring conflict of interest. For example; both Alan Bensoussan and Caroline Smith is (was) listed as consultants, for many years, of commercial acupuncture clinics (they deleted this information as soon as they became aware that I am investigating this issue – you can find an archived page here), the director of these clinics is part of the advisory board of the NICM, students of the NICM find employment at these clinics, the NICM is actively doing research where a positive outcome will clearly benefit these clinics, and the clinics have donated $20 000 to the NICM for the “IVF project” – clearly something that needed to be declared. You can find more details about this very obvious conflict of interest here and here. But what is this IVF project? An independent journalist called it “Universities in a wacky waste of cash” whilst the NICM called it “Acupuncture to Improve Live Birth Rates for Women Undergoing IVF”, approved by a WSU ethics committee and funded to the tune of $600 000. This is what an IVF expert had to say about this project: “IVF expert Professor Colin Matthews was outraged the National Health and Medical Research Council had allocated more than $600,000 for a study into acupuncture’s effect on IVF.” The WSU ethics committee that approved this study is fully aware that acupuncture has been shown to be nothing more than a placebo and that it is based on fake scientific principles – hence it is called a pseudoscience. This is now a problem because not only have they abandoned science but they also, seemingly, abandoned their ‘strict guidelines’ to ensure scientific integrity. But let’s argue that the ethics committee simply did not know about this. Surely, when they are notified about this they will certainly take action to ensure that the trust between the public and academics do not further erode? So, I notified the WSU ethics committee, the advisors to the ethics committee and a number of other people at WSU regarding this issue over a number of months. And now I can reveal their response, and I will quote them; “………………………………..”. Nothing, they did not even acknowledge that they have received this information. After six months, it might be safe to assume that WSU do not plan to do anything about this issue. But then again, I am not at all surprised, as science adheres to the laws of nature (chemistry, physics, biology, etc. ), pseudosciences are above those laws. Scientists are held accountable by enforcing these strict guidelines to ensure scientific integrity, sadly, these guidelines do not seem to apply to a pseudoscientist – they are just above it! Let me try to put all of this into perspective. Most people do not consider infertility to be a life threatening medical condition. It does, however, have a severe impact on a person’s life, causing broken relationships, severe depression and in extreme cases, even suicide. The more treatment methods a person tries in order to conceive without a positive outcome, the more prone a person is to fall into severe depression (maybe it should be considered as a life threatening condition?). And this is where a pseudoscientist strike, they feed off desperation. If a researcher knows that the method that they recommend is only a placebo, then the project is unethical by default, and it should never have been approved. And oh boy, don’t they know this. There is a reason why they want to ‘integrate’ acupuncture with IVF (which has a success rate of around 45% at 35 years of age or younger, and around 5% when 42 or older), because they know acupuncture is nothing more than a theatrical placebo, and therefore they need to piggy back on something that actually works. If acupuncture worked that well, why don’t they use it as a standalone treatment option? Why did they start these commercial clinics in 2008 and only in 2013 are they doing a ‘scientific’ study to test if it is actually effective or not – wrong way round, maybe? And if the study turns out to be negative, will they close their clinics? For some reason, I don’t think so! Having said that, I do not expect to receive any response from WSU. In a previous article I have written about the dishonest type of people that you need at the NICM, this article illustrates that the WSU management themselves are not much better – they are just as dishonest. Hence, the Vice Chancellor, Prof Barney Glover, who is aware of this and many other issues at the NICM, was also nominated for the Bent Spoon award in 2016. Oh, and did they try to squash this nomination, but to no avail – you can read about their hilarious attempts here. But, maybe it is a good idea if a couple of readers can email the ethics committee at WSU, just to ask what is going on with this issue. This might even prompt them to respond (email Steve Hannan at s.hannan@westernsydney.edu.au). This brings me to their scientific publications. Journals are usually independent of universities, and as such, they might be able to perform the important job of being the ‘gatekeepers’ of scientific integrity. I have contacted the editors of four scientific journals regarding only five of the NICMs scientific publications, where they intentionally did not declare their obvious conflicts of interest. Here I will discuss the response that I got from one editor (I’ll report separately on the response from the other editors, and the other organisations investigating this issue). Senior author Caroline A. Smith is a Consultant for a chain of acupuncture fertility clinics in Australia who in turn has donated a substantial amount of money to her research group. The information regarding her consultant capacity for these acupuncture clinics has since been removed from their website but can still be found on the internet archive which you can access here. The reason for this removal appears to be based on an article that I’ve written regarding this matter. This is not an isolated case, with four articles published in 2016 on acupuncture and fertility related issues where their conflict of interest is intentionally omitted. The editors of the other journals have also been contacted. I hereby request that this matter be investigated. I have contacted my Elsevier publisher and she is investigating as you requested and will get back to you in due course. This was unfortunately also the only response that I received from this editor and needless to say, nobody from Elsevier contacted me. As this is now more than 6 months ago, with all my subsequent follow-up emails being ignored, I believe it is safe to assume that this editor never intended to do anything about this issue. So, I had a look at this editor and it turns out that Prof Robinson happens to be an acupuncturist and that she has co-published with the research group in question – and the title of the research paper? “Does acupuncture improve the outcome of in vitro fertilization? Guidance for future trials”. So, she knows the people at the NICM quite well, she know the project quite well, and hence she is also aware that pseudoscience does not abide by the laws of nature nor does pseudoscientists abide by the laws that should ensure scientific integrity. They just need to remain quiet and ignore any complaints, and hopefully everything will blow over and they can happily continue to mislead the public. So, in this case, don’t expect anything from this ‘gatekeeper’ of science – she apparently has way too many vested interests. In a next article, I will report on the feedback from the other editors, the NICMs attempts to mislead one editor and a couple of corrections to their ‘scientific’ publications that they have been forced to publish. Once a criminal, always a criminal? The curious case of Gregory Kolt, the guy who signs off on the NICMs plans. So, who is Gregory ‘guy that signs stuff’ Kolt? Well, as his name implies he is the man who has to sign off on just about everything. How loud you may talk, how fast you may walk and even when you may take a bathroom break. You can just imagine that Gregory, as Dean of the School of Science and Health at Western Sydney University (WSU), has a huge number of documents that needs to be signed on a daily basis, in order to keep his subjects in line. On top of this, he is also the man to whom the director of the National Institute of Complementary Medicine (NICM) reports, and hence he also has to sign off on almost everything that the NICM plan to do. Regular readers of this Blog will by now know, that most things that the NICM does is simply put, dishonest, and as such Gregory is fully aware of what the NICM is up to. He is, after all, on the NICM’s advisory board where ways to make more money by misleading the public is openly discussed. And again, if you can promote, defend or sell water as medicine to sick children then you are not only dishonest but, in my view, a common criminal. Because of this, the ‘guy that signs stuff’ was nominated for the Bent Spoon award (for the pseudoscientist of the year) together with Alan Bensoussan (director of the NICM) and Barney Glover (VC of WSU). These three musketeers are fully aware that what they are doing is at best dishonest and that it will have a detrimental impact on society, not even to speak about the impact on science. They tried their best to block this nomination, but to no avail, with their measly attempts now providing us with some excellent, or even hilarious, reading material (you can find it here). Unfortunately, they did not win the award in 2016. The defendant, a physiotherapist, submitted invoices claiming payment from the Victorian WorkCover Authority in relation to his purported treatment of four injured workers. The invoices related to 137 physiotherapy consultations that had never taken place. As a result, the defendant fraudulently obtained a total of $5,864.15 from the Authority over a period of 14 months. When the matter was investigated, the defendant provided false information and documents. Breaches of the Accident Compensation Act 1985, sections 248(1) and 249(1) x 2. Some might now say that digging up old court cases, to put someone on the spot many years later, is not a nice thing to do. Many people make mistakes, pay for it and then learn from it. But I am afraid that this court case show that Gregory planned his offence well, it occurred over a long period of time and then he tried to mislead the investigators by covering up his actions. And this means, in one word, that he is a dishonest person. Dishonesty is something that runs in your blood and it is part of your DNA, and if you draw the line through to 2017, not much has changed. Dishonesty is of course not all bad, for example; with this sparkling attribute you can easily find a job with just about any political party, the mafia also comes to mind, and then of course, you can also become the guy that signs off on all of the NICM’s dishonest plans. Once a dishonest person, always a dishonest person? But enough on Gregory for the time being (I am sure there will be more to come). And again, we have a person linked to the NICM who tried to BS officials. One would think that Alan as a ‘honest scientist’ would try his best to explain to Mr Yu that traditional Chinese medicine is based on pre-scientific ideas and that it is a believe-based healthcare system, and as such, is dangerous not only for people but also for (endangered) animals (they are currently skinning donkeys alive for their purported medicinal value). This, of course, applies to any believe-based healthcare system, but I guess this would have been the honest thing to do and honesty does not sit well with the NICM – simply because honesty will cost them way too much by way of a significant decrease of external funding. So, here and here you can read about the NICM’s view on using endangered animals as medicine. Mr Yu was send to prison for a couple of months, and as expected, the NICM is currently still collaborating with him. The examples that I have given above isn’t isolated cases, but it should help to illustrate what type of person you need at an Institute such as the NICM. My next article will give another example of an even grander scale of dishonesty where, as it currently stands, they are trying to cover up their undeclared conflicts of interest. And as usual, money seems to be at the heart of the problem. It turns out that these people are not only above the laws of nature as expressed by physics, chemistry, biology etc., but that they are also above the rules that should ensure scientific integrity – it simply does not apply to them. ‘Take control of your health’, and we’ll take control of your wealth! “Take charge of your health by being an informed consumer” or “….empowering patients to take control of their health and wellbeing” etc. These are very common statements made by proponents of complementary, alternative and integrative medicine (CAIM), and it conveys a very clear message; you should take control of your health! But the question is; what do they really want to achieve with this message? If we look at this superficially, we might think that they refer to a healthy diet, physical exercise and other positive lifestyle changes, but then again, any medical doctor will give you this advice as well. One might think that being an ‘informed’ consumer is clearly good advice, but then again, why do they continue to provide the public with misleading and false information regarding their CAIM products and therapies? So, it cannot be this either. So, what is it that these people really want to achieve with statements like this? Well it’s simple, they want more people to buy their disproven and unproven products, and hence they aim to manipulate us, with using statements like this, in doing just that. One of their techniques is what I call, a soup kitchen approach, where they provide some good information for free, in order to lure us into their web of deceit. Because they do not make much money with their ‘good advice’ (e.g. lifestyle changes), they are thus hoping that we will also fall for their false and misleading information regarding the benefits and safety of a huge range of products, that they happen to sell. To give you a rough idea of the sheer number of ‘products/services’ in their arsenal, please have a look at this table. So, allow me to translate what they actually want to achieve with their ‘take control’ statement. There are two important aspects; creating distrust in conventional healthcare, and masterfully exploit a very common innate cognitive bias that we all suffer from, in order to increase their sales. Let’s first look at creating distrust in conventional healthcare. With this message, they are implying that our health is currently in the hands of someone else, and that we should now take it back – it is our right. This is quite misleading. Lifestyle choices is indeed in our hands, but even people with the healthiest lifestyles, still get sick. And when you do get sick, you should go to a qualified medical doctor, get a proper diagnosis and a conventional medicine prescription – if needed (most people do not have the medical knowledge to do this themselves). In this conventional approach, we do not have much control and we put our trust in the hands of trained professionals. According to the CAIM proponents this is not a good system because you need to be in full control. So, with their ‘take control’ message they are actually creating distrust in conventional healthcare with some even going as far as stating that very little of conventional healthcare has been proven to work, or that medicine just treats the symptoms and not the cause, or medicine doesn’t work at all, it is just toxic etc. Clearly, the real message here is that we should not really trust our doctor or conventional medicine, but we should trust ourselves and we should make our own healthcare decisions. The CAIM proponents only provide the ‘options’ that we can choose from, but unfortunately, they are notorious for making false and misleading claims about these ‘options’. And don’t they provide a massive range of products to choose from (and importantly, many pharmacies also benefit from this situation). In Australia, you have a choice of roughly 20 000 CAIM products. In South Africa, it is estimated that there are more than 155 000 products, and I have been informed that none of these products have had their quality, efficacy or safety verified! But who cares, they want you to trust yourself and to decide which of these products will work for you. The second aspect is exploiting an innate cognitive bias that we all struggle with. All of us are continuously performing risk-benefit analysis, usually, without us even knowing it. Everything we do; getting out of bed, driving to work, going for a walk in the park etc. carries a risk and hence we will continuously perform a risk-benefit analysis. The CAIM proponents are skilfully exploiting the fact that we sometimes struggle to get this right, and in some cases, we just get it completely wrong. For example: we are far more likely (up to a thousand times) to downplay or ignore a risk if we perceive to be in control of a situation. A good example: we are far more likely to get into a car (we are in control) than getting into a plane (a trained professional is in control), even though the former is much riskier than the latter. Using false and misleading claims for their products and making their ‘take control’ statements, we are hoodwinked into perceiving that we can be in full control of our health, and hence we are far more likely to ignore the (in)direct risks associated with CAIM products. And this is where they are really making a killing with their ‘take control’ message. Add to this the distrust that they are creating in trained professionals and conventional medicine, then it is no wonder that more and more people are consulting Dr Google and buying OTC CAIM products. The CAIM proponents are quite happy with this situation because they can now use the explosive growth in sales figures as ‘evidence’ that their products work – the typical appeal to popularity fallacy (another weapon in their arsenal). So, what is the take home message? With their statement, they are trying to take healthcare out of the hands of professionals and they want to place it in your hands (and you don’t have the medical knowledge), knowing fully well that in such a situation we are much more prone to take a risk by dipping our toes into their disproven and unproven CAIM therapies and products – it is all about money! But is there anything we can do about this? We are irrational beings, so trying to change or influence human nature is highly unlikely to succeed. The only thing we can do, is to continue to expose how the CAIM industry misleads the public, and hopefully, one day, politicians and regulators will start to impose very tight restrictions on this industry, which frankly speaking, should not have existed in the first place. Western Sydney University’s new TCM ‘hospital’ opening soon in Sydney! Great news, because the most important information that I’ve added stayed on their Wikipedia page, but at the same time, terrible news, because over the past year, WSU has made absolutely no attempt to investigate or rectify the problem at hand – let alone ‘repent’ from their open support of quackery. This is after all my main objective!! If anything, in 2017 things just got worse, and 2018 promises to be a humdinger of a year – that is, if you are a pseudoscientist. At the centre of WSUs controversial support of complementary, alternative and integrative medicine is the National Institute of Complementary Medicine (NICM). They have very big plans and a lot of money is involved. For example: Say Hello to the newest Traditional Chinese Medicine (TCM) ‘hospital’ opening in 2018 in the Westmead health precinct of Sydney. Using the smokescreen of “Integrative Medicine” and partly funded and operated by the controversial Beijing University of Chinese Medicine (BUCM), this should be the highlight of 2018 for any pseudoscientist. This new ‘hospital’ will emulate Germany’s first TCM hospital (also funded and operated by BUCM) in Bad Kötzting, and if you have a look at their website, any person with half a brain would be extremely worried – but not WSU management! And to think that WSU is currently conducting: “A study looking into ways of reminding people to take their health supplements is being conducted by a PhD student at Western Sydney University. An avatar- based iPad application that can verbally express reminders along with a portable pill organiser that can emit alarms at scheduled times are being tested as a part of the study.” Uhm, Blackmores donates $10 million, Uhm, Blackmores also happens to sell these supplements – truly top flight medical research happening at WSU. A LOT more to come, especially about the TCM ‘hospital’! I would argue, pseudoscience! Because if you do not see the following as pseudoscience, then all hope is lost. There is a lot wrong with this, but let’s just focus on what this remedy contains. It is a mixture of nine homeopathic remedies, including Belladonna 200C and Gunpowder 30C, with the purpose of the latter being; “Localises the infection preventing deeper penetration into tissues.” The 200C and 30C indicates that these substances have been diluted by a factor of 10400 and 1060 respectively, and consequently neither contain a single molecule of the original substance. This might be a good thing, especially for Belladonna which is a highly poisonous herb, and something that you definitely do not want to give to your children. Incorrectly diluted Belladonna (in a different homeopathic remedy) has recently been implicated in the deaths of ten infants in the US. As for the Gunpowder 30C, well, some homeopaths are known for diluting the Berlin Wall for the treatment of depression, and a whole host of other conditions, so why not gunpowder? But let’s step into the mind of a homeopath, and try and explain the logic behind the Gunpowder 30C. Here goes: Gunpowder is used to fire a bullet which will, depending on the entry location,, cause serious harm or death. If you are only wounded, the wound can become infected, the infection might spread throughout your body, and eventually you may die. Using the homeopathic principle of ‘like-cures-like’, it therefore ‘stands to reason’ that when you dilute gunpowder, by a factor of 1060, it will localise and prevent the infection from spreading any further. Because the underlined words look alike, it is irrefutable scientific evidence that Gunpowder 30C is a remarkably effective remedy. I am however only guessing here, but it is clear that the amount of science involved is truly mindboggling (any homeopath reading this, please correct me if I am wrong). A quick search reveals that homeopathic gunpowder is more commonly used for the treatment of septic wounds in people and animals, which I guess, makes more sense in a homeopathic sort of way. Let’s say that I do not have any scientific background and that I’ve decided to buy the BlueBoxTM. Before coming to this decision, I’ve spoken to a homeopath (a specialist), I’ve discussed it with the extremely helpful people at the pharmacy, I’ve read all the info on the website of Pegasus (the producers), and I’ve even gone as far as to read the lengthy WHO report, which recommends that homeopathy should be integrated with conventional healthcare. All-in-all, it paints a very positive picture and I, and many others, will feel confident in the safety and effectiveness of this product. And hence, I will happily give these remedies to my children. Why not? But what now if my young child die, due to an infection that I’ve treated with anti-virabac 200C? The infection worsened very quickly, within 48 hours, and upon hospitalisation it was already too late to save his life. At the end of the day, this remedy contains nothing other than the diluent, and will do absolutely nothing against any infection. A fact that is reflected in the Australian NHMRC homeopathy report, where they clearly state that: “People who choose homeopathy may put their health at risk if they reject or delay treatments for which there is good evidence for safety and effectiveness.” Tragically, this happens quite often, with an unknown number of people dying because they have chosen ineffective homeopathic remedies. Gunpowder 30C for the treatment of infectious diseases and/or septic wounds, really? The number of victims is unknown because the BlueBoxTM, and all other homeopathic remedies, are bought over-the-counter. There is no paper trail and hence no system in place to document ‘adverse events’. So, if you or your child dies, the cause of death will simply read infectious disease or septic wound – and that will probably be the end of it. Who is to blame for this situation? The homeopath, pharmacist and all other role players are legally doing what they are doing. They are allowed to sell you water as a treatment for many different medical conditions. You, on the other hand, as a parent who’s child died because of these ineffective remedies, can however be taken to court and you might even be send to jail – and this is the ‘Homeopathy Paradox’. This is also where the important role of Vice Chancellors (VC) come into play. They are instrumental in deciding on what path science will take in a specific country. Their role is becoming more important, especially in light of some politicians nowadays resorting to all kinds of alternative facts. Take someone like Prof Barney Glover, VC of Western Sydney University (WSU), and also the current Chair of ‘Universities Australia – The Voice of Australia’s Universities’. He has influence over the whole scientific landscape in Australia, and quite recently gave a very good speech at the National Press Club (photo above), about the necessity and importance for universities to stand up for facts and the truth, because nobody else will. This is very encouraging but, unfortunately, very misleading. Prof Glover was notified in 2015, that he should urgently investigate the National Institute of Complementary Medicine (NICM), because of their continued (in)direct support of homeopathy and many other disproven complementary medicines. For example: the NICM had a big influence in compiling the WHO report, calling for the better integration of homeopathy (implying that it is an effective healthcare system) with conventional healthcare, and by way of their extended network, has tried to discredit and destroy the NHMRC report on homeopathy. Their incorrect and misleading response to the NHMRC report is now being used by homeopaths, all over the world, to continue to mislead the public regarding the effectiveness of homeopathy. Unfortunately, neither the VC nor anyone else in WSU’s management has yet taken the very important step of standing up for science. 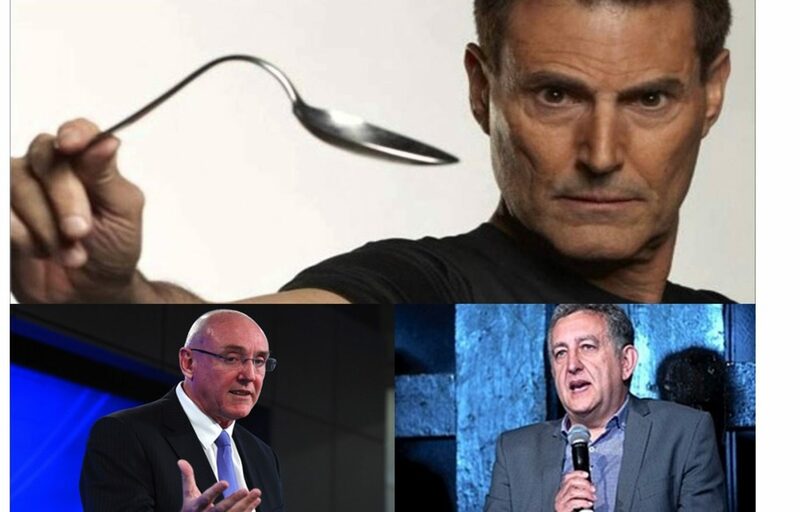 Therefore the VC, and others, were nominated for the Bent Spoon Award in 2016. A nomination that they tried to block, but after independent review, did not manage to do so. VC’s that do not stand up for science can therefore have a far-reaching impact, such as convincing me, who live on the other side of the world, to buy the BlueBoxTM, which in turn, might lead to my child’s death. Let’s call it the ‘butterfly effect’, with a ‘minor’ act (allowing pseudoscience at their university) on one side of the world, causing a lot of carnage on the other side of the world, or the world over. (The reason for WSUs refusal to investigate the NICM seems to be as simple as increasing their external income. And it works, because quite recently the controversial supplement company Blackmores donated $10 million, and a year or so ago, the extremely controversial organisation, the Jacka Foundation, donated $4 million. These numbers appear to be enough for WSU to continue to hold their hand of protection over the NICM). WSU is by no means the only university that has put money before science and ethics. Take for example the University of Johannesburg (UJ) who has a ‘Department of Homeopathy’ (they featured on this Blog before – see for instance here). A couple of days ago I emailed the Dept. of Homeopathy, asking for advice regarding homeopathic malaria remedies for my 6yo son before we travel to the Kruger park. They advised me that they do not sell it themselves, but that I should contact a specific pharmacy and ask for….wait for it….a banned herbal remedy and for homeopathic antimalarial drops – the latter, of course, does not contain anything other than solvent. This advice comes straight from a University, and although this issue is still unfolding, I am hopeful to have more luck with UJ’s VC – but I am not holding my breath. So, if you happen to work at any one of these two universities, could you kindly forward this article to your VC? For what it is worth.